My excuse is that I’m getting ready for Cinco de Mayo celebrations. Mexicans love chocolate. The Incas used chocolate in rituals. I can agree with that. Here’s a recipe I found on the website called Baking and Boys! One of my favourite foods. This is so not diet food. Last year, we bought an ice cream maker. An electric jobbie with a freezable container that you fill with luscious mixtures of flavoured custard or sweetened fruit juice and frozen fruits. I bought it when I had to have a molar implanted and I wasn’t allowed to eat solid food for the day before or a couple of days afterwards. My answer – homemade ice cream. No additives or artificial gums. No red dye # whatever or by-products of any kind. Simple, natural products that I can biy at the supermarket or grow in the garden. Calcium for my aging bones, flavour just because, chocolate for its zinc and healing properties. I usually add a bit of ground cinnamon or fresh coffee beans to punch up the chocolate flavour profile. 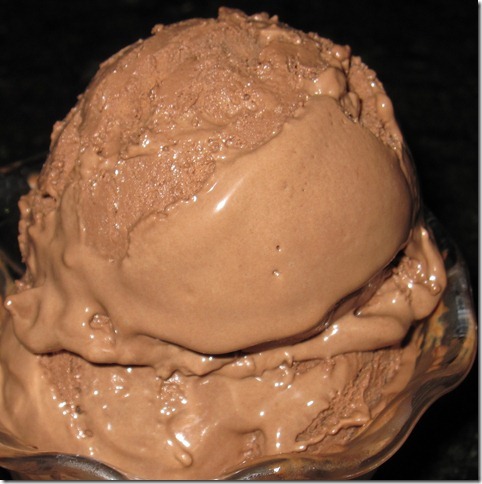 I go for dark, dark bittersweet chocolate in this ice cream, but it is good made with semisweet as well. (You could even use milk chocolate, but the flavor will be very mild.) It’s also good with chocolate chunks, rum raisins (page 92) or both, tossed in at the last minute of churning. Put the chocolate in a 2-quart liquid measuring cup or a large heatproof bowl. Bring ¾ cup of the cream to a boil. Pour the cream over the chocolate and let it sit a minute, then using a rubber spatula and starting in the center of the mixture, slowly stir the cream into the chocolate in ever-widening concentric circles. When the ganache is smooth, set it aside. Bring the milk and the remaining ¾ cup cream to a boil in a medium heavy-bottomed saucepan. Meanwhile, in a medium bowl, whisk the yolks and sugar together until well blended and just slightly thickened. Still whisking, drizzle in about one third of the hot liquid—this will temper, or warm, the yolks so they won’t curdle. Whisking all the while, slowly pour in the remaining liquid. Pour the custard back into the pan and cook over medium heat, stirring without stopping, until the custard thickens slightly and coats the back of a spoon; if you run your finger down the bowl of the spoon, the custard should not run into the track. The custard should reach at least 170 degrees F, but no more than 180 degrees F, on an instant-read thermometer. Immediately remove the pan from the heat and slowly and gently stir the custard into the ganache. Scrape the chilled custard into the bowl of an ice cream maker and churn according to the manufacturer’s instructions. Pack the ice cream into the container and freeze it for at least 2 hours, until it is firm enough to scoop. Makes about 1 quart. Serving: If the ice cream is very firm—as ice cream made with premium-quality chocolate often is—allow it to sit on the counter for a few minutes before scooping or warm it in a microwave oven using 5-second spurts of heat. Storing: Packed tightly in a covered container, the ice cream will keep in the freezer for about 2 weeks. Hahaha. It won’t last that long – trust me. You take a small bowl and measure out half a cup. Yu take tiny bites from the end of your teaspoon, letting the ice cream melt on your tongue and slither down your throat in a flow of dark goodness. Then you realize that the bowl is empty and you lick up the rich chocolate slick on the bottom. Just a little bit more…then a little bit more. Ummmmm.